Build and deploy games and apps for Amazon Appstore using Marmalade which delivers native performance with low level access to device hardware, no virtual machine CPU and memory overheads. The Marmalade for Amazon SDK unlocks the full power of native development for Amazon's family of Fire devices, with a choice of C++, Lua and more for app development. This SDK is free to all developers interested in publishing apps and games on the Amazon Appstore and Amazon Underground. The Marmalade for Amazon SDK also provides support for Amazon services including: IAP, GameCircle, Amazon Mobile Ads, Amazon Insights and Amazon Underground. The tools include a simulator preconfigured with a selection of Amazon Fire OS device resolutions that allow you to quickly test and debug your projects using your Mac/PC. 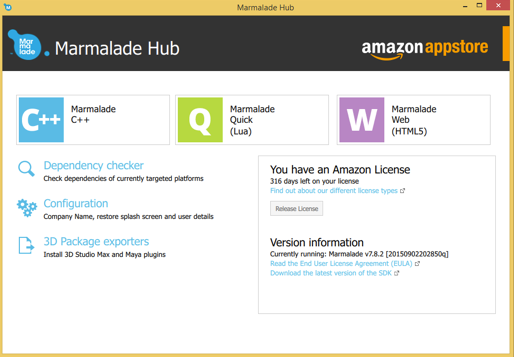 Uploading your app packages and metadata to the Amazon Appstore is easy because you do not need to leave the Marmalade Hub. The annual license is free and when you are ready you can switch up to Marmalade’s full licence to target other platforms. You can download the SDK here. I’m excited about this. I love Marmalade's cross-platform support with the low overhead. I'm exploring Marmalade now and will share my experiences with publishing my app. I’d like to hear from you too, please let me know how your experience goes over on my twitch channel. Join me for an informational webinar on Wednesday, September 16th to learn everything you need to know about Amazon Underground and how to get started. Register today!